Reserve 2 tablespoons tomatoes for garnish. In food processor, place remaining tomatoes and all remaining ingredients except pita bread. Cover; process about 1 minute or until smooth. Spoon hummus into shallow serving dish; spoon reserved tomatoes in small mound in center. Serve with pita bread. Serve the hummus with fresh vegetables, pita chips or crackers instead of pita bread. Recipe Variations Fire Roasted Tomato Hummus with Basil: Prepare hummus as directed. Add 1/4 cup chopped fresh basil leaves; process 15 to 30 more seconds. Garnish with additional basil leaves, if desired. 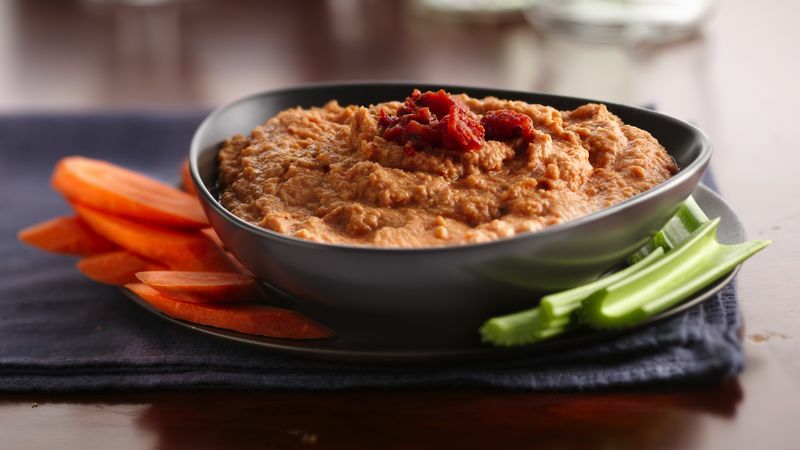 Fire Roasted Tomato Hummus with Cilantro and Green Chiles: Prepare hummus as directed—except increase crushed red pepper flakes to 1/4 teaspoon. Add 1/4 cup chopped fresh cilantro, 3 tablespoons Old El Paso® chopped green chiles (from 4.5-oz can), drained, and 1/2 teaspoon ground cumin; process 15 to 30 more seconds.